Rival mobs scheme, negotiate, and back stab as they battle for control of the city. 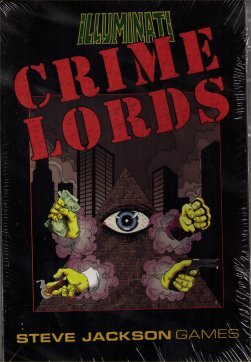 Recruit crooks, take over the rackets, rake in the dough, and rub out the opposition in this stand-alone card game based on the Illuminati system. This game is sweet once you sit down and learn how to play. It plays a lot like the original Illuminati, but with a gangster theme. You build your mob and pit them against rival mobs (other players). There are a bunch of small pieces that can easily be lost, so keep the game somewhere safe & stable, or at least have a watchful eye on the markers. I really love this game. it typically takes 1.5 to 2 hours to complete a 2 player game.